Being a local Fort Lauderdale, Florida internet marketing agency we know that search engine optimization is an indispensable part of any successful business that requires local business to thrive. Ever since search engines really took off in the late 1990s and early 2000s, companies in almost every industry have benefited tremendously from taking actions to increase their website's rankings in search engine results. Brandamos is a leading local SEO company that can help clients and customers in your area find your business online. With an effective, well-implemented SEO strategy from the creative strategists at Brandamos, people in your area who search for products and services that you offer will be able to find your company quickly and easily, giving you an edge over your competition and increasing your sales. There are three main types of SEO that will help your business thrive: organic SEO, social SEO, and local SEO. Organic SEO involves optimizing your website for relevant "long tail" keywords, leading potential customers to your website when they enter search terms that are related to your products or services. Social SEO works through social media websites, leveraging the power of platforms like Facebook and Twitter to guide traffic to your site. Do You Own One of These Businesses? We Need to Talk. Local SEO focuses on optimizing your website to have a high search engine ranking for searches by people in your local area. 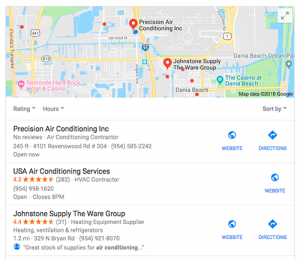 For example, if you're an air conditioning repairman in Clearwater, Florida, you'd want your website to come up when someone is searching for "air conditioner repair in Clearwater." 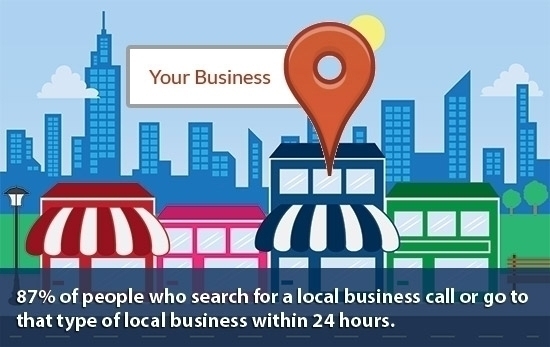 Local SEO is an incredibly powerful tool for bringing in business. When people need a particular service, they generally search online. If you’re a business that mostly sells to people in your geographic area, it’s imperative that your website is tailored for local search engine optimization. Search engine results are increasingly personalized, which can be good news for your company website’s local SEO. It doesn’t matter much if someone in Sheboygan, Wisconsin finds your Clearwater HVAC company, but you want to appear when locals search the Internet for someone to fix their air conditioner or install their new water heater. Tailoring your website for maximum local SEO results involves a combination of backlinks, or links to your site from elsewhere on the web, and careful use of relevant keywords in the text that appears on your website. As a leading local SEO company, Brandamos employs knowledgeable, experienced search engine strategy experts to determine exactly how to help your company’s website dominate local search rankings. There are scores of SEO companies out there, many of which really aren’t that great. They know that most business owners don’t know a whole lot about search engine rankings, so they overcharge unwitting clients for sloppy work that brings subpar results. The SEO landscape is ever-changing and dynamic, and techniques that worked a few years ago have lost their effectiveness. The creative analysts and strategists at Brandamos stay up to date with the latest developments in SEO, tailoring their approach to meet the changing requirements of search engine algorithms. With unscrupulous companies often trying to game the search engines with dishonest “black hat” SEO techniques, Google and other search engines are constantly updating the algorithms that they use to determine what websites are given the highest rank. Inferior SEO companies that use outdated strategies and put out low-quality web content are often left in the dust by these algorithm changes, to the detriment of their clients. Along with well-written web pages and high quality content, social media is the next step to reaching your company’s full potential with local SEO. Brandamos can help you leverage the power of social media to increase your search engine visibility and reach out to local customers. Social media marketing provides an unprecedented opportunity to connect directly with your audience of potential clients and customers, making it a powerful tool in the hands of experienced SEO professionals. With an active presence and great content on Facebook, Twitter, and other widely used platforms, they can help you reach out to your audience to bring in web traffic and ultimately increase your sales and revenue. When it comes to SEO, you always want to hire the very best company you can find. Brandamos has the experienced, skilled staff and dedication to quality to bring you the SEO results that your business needs. Google My Business directory is definitely the number 1 item that matters outside of optimizing your website that can impact your local rankings. Since Google searches make up the majority of online searches, your GMB profile absolutely essential to be setup correctly and optimized. Part of what we do with our local SEO services is the upkeep of your Google Business Profile. If this is not setup correctly your website and snippet will not rank or be viewable in the map pack. Google not only serves your website listing in the SERPs based on the searcher's location, but there are other factors involved. One of the most important items to consider as mentioned above is to have matching data in your GMB profile and your website. a Another factor is strength of NAP - Name, Address, Phone Number, domain age. What is the depth of this layer? The number of people that click on mappack results is one of the items Google calculates. So creating having good titles (if you rank there) is important to staying there. These are some of the factors Google evaluates regarding your local SERP listing. This is a lot of information to process. We should probably talk about how we can help your business rank locally on Google and obtain those coveted search engine spots.